In last July's blog I wrote of my bitter disappointment at my foiled attempt to see the most celebrated British butterfly, the Purple Emperor, while discovering that, in the famous words of Dorothy from the Wizard of Oz, "there's no place like home". To rub salt into the wound, 2017 proved to be an amazing season for Apatura iris and a particularly bad year to be benched. Right as my blog was published, Purple Emperors were, remarkably, seen for the first time in the Sheringham/Beeston area on the North Norfolk coast. They will need to be recorded for five consecutive years however to be classed a Norfolk resident. I spent the year conserving my energy and biding my time, yet all the while the memory of the trip I hadn't made to see the King of butterflies in a peak season linged in the recesses of my mind, surfacing occasionally to niggle away at me. His majesty had ensnared me after all, at least a little. Come late June and I had some leave left at work. The timing looked on paper to be perfect, but after a bumper year last year, I fretted that the early super-cold snap might have affected them. What if the population had collapsed, or this year's weather proved unfavourable? My first week off was an anti-climax, dry but coolish, windy and unsettled. No reports showed and I felt fidgety, restless and frustrated, fearing that my timing was off and I would have another run of bad butterfly luck. Suddenly the temperatures rose, the long predicted heatwave actually appeared and reports started to trickle in. I grasped my last chance to take the trip and headed towards a less visited Wood in Northamptonshire, close to the Purple Emperor's stronghold at Fermyn Woods. I experienced butterflies of the tummy variety as I drove up the deserted, deeply rutted dusty track at my destination. I'd been running a little late and the temperatures were soaring. Emperors are notoriously active in the afternoons and apparently once charged up rarely come down from the canopies. Was I already too late? As I got out of my car my spirits lifted. A large black and white butterfly immediately swept past the car door zooming along, low above the ground at a high rate of knots. Could it be that easy? Had I already seen my target? 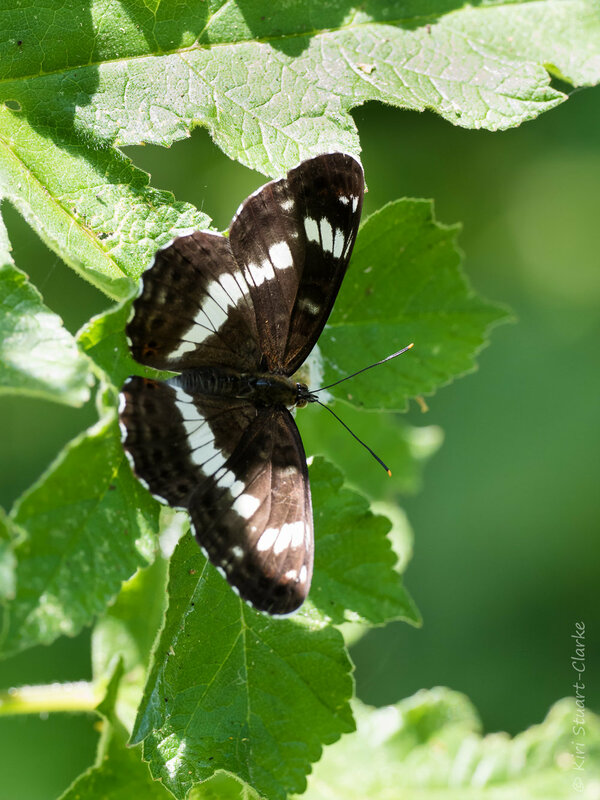 Was it a female Purple Emperor or the smaller also black and White Admiral? I'm not sure I will ever be certain whether that was really my first sighting. The flight was fast and powerful, though I definitely didnt catch a flash of purple. Nonetheless it proved a good omen, as I had barely entered fifty yards into the woods when I found an elderly Black Hairstreak and an unusually confiding White Admiral basking by the side of the path. Just a few yards further on I suddenly spotted a fellow Emperor hunter photographing a sizeable butterfly "puddling" (taking up salts from mud) on the ground. The richly marked russet-orange underwings were unmistakeable - this was was no White Admiral! 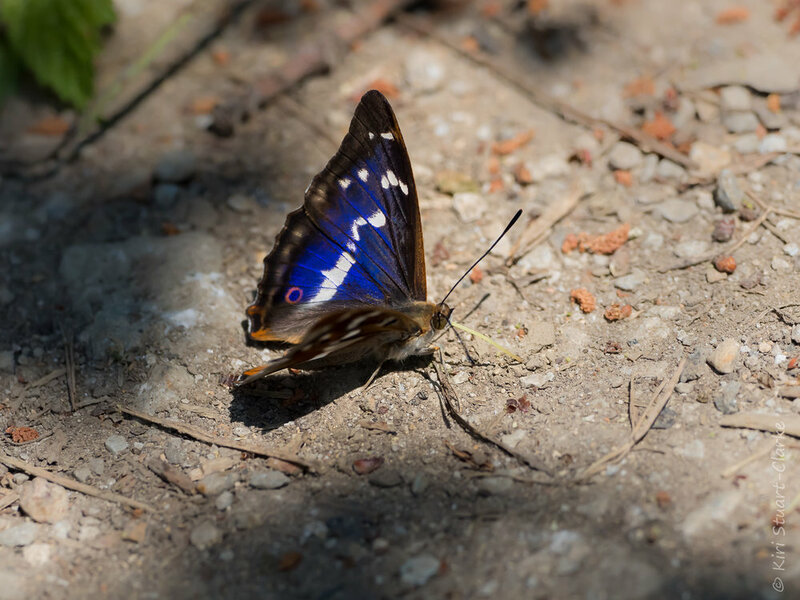 Purple Emperors also take in trace salts from the ground, animal droppings and other pungent substances, a behaviour known as "mud-puddling"
The Purple Emperor continued to probe the ground with its proboscis, wings stubbornly closed, for some minutes. Then suddenly it snapped its wings open vigorously, catching the sun's rays. The light glanced off the Purple Emperor's wings obliquely and a flash of iridescent purple appeared from nowhere. His Majesty resplendent in his imperial cloak. Just as quickly the sparkling colour vanished and reverted to black as the butterfly rotated further round towards the sun. Mission accomplished. For around an hour or so the Purple Emperor and at least one Purple Empress wafted up and down the track in their finery, alternately mud-puddling and looping up high in a figure of eight around what seemed to be a pair of "Master" trees, one an Oak, one a Common Sallow. I was also treated to the sight of a female Purple Emperor perched up in the more attractive setting of a Sallow tree, apparently feeding on honeydew. Shortly after one o'clock I enjoyed my last figure of eight looping fly past and both I and his Majesty parted ways and headed off to attend to the rest of the day's business. It all seemed so strangely easy in the end that I actually felt a little nonplussed. Why all the fuss, I wondered? Wasn't Iris famously elusive? Where was the challenge, the mystery? Maybe there was none and my scientific research had paid off, maybe I had simply been lucky or maybe, just maybe, fickle fate had at last taken pity on me and requested Iris to grace me with his royal presence in a random act of kindness. Whatever the answer, I drove home at peace, with the ghost of the Purple Emperor past of 2017 that had never been seen, well and truly laid to rest. Two very different, yet equally enigmatic, purple butterfly species are on the wing towards the end of June into mid-July. Though very different in fame and stature, both share two things in common: a fondness for the heady heights of mature Oak tree canopies in deciduous woodland and a strong reputation for elusiveness and ability to evade the gaze of even the most determined of butterfly seekers. Since being drawn into the world of butterflying I've discovered that, since time immemorial, avid butterfly chasers have gone temporarily a little doolally at this time of year. The hysteria is all over a certain famous, purple-cloaked member of the royal family who is not, officially at any rate, currently resident in Norfolk - the magnificent Purple Emperor. Known affectionately to his acolytes as "his Majesty" or sometimes simply "Iris", the Purple Emperor is neither Britain's largest butterfly (our very own Norfolk Swallowtail), nor the rarest (the once extinct, recently reintroduced Large Blue), nor even the brightest (arguably the Silver-washed Fritillary) so this seemingly bizarre Purple Emperor obsession had been puzzling me for some time. Just what quality is it that bewitches them all? Is it the dramatic colour purple? Their reputed vigorous flight and aggressive behaviour? Or some other mysterious factor altogether ....? After an inspiring talk by renowned butterfly conservationist and Purple Emperor advocate Matthew Oates at Norfolk Butterfly Conservation's AGM back in 2016, I became intrigued and not a little bewitched myself. In a bid to sate my curiosity and discover the obscure reason for the Purple Emperor's celebrity status for myself, I started planning a field trip to visit his Imperial Majesty's haunts, mature Oak and Sallow woodland rides. Alas fate was not on my side, despite attempts to make visits to Fermyn Woods in Northants, Wood Walton Fen in Cambridgeshire or Theberton in Suffolk, life events have intervened and scuppered my plans well and truly for this year. Perhaps Iris is to be my new five year nemesis butterfly, who knows. With my ability to range much curtailed, I was crestfallen and deeply disappointed. But there was still the second less famous, but to me equally elusive, purple butterfly to discover: the Purple Hairstreak butterfly, Neozephyrus quercus. And it lives much closer to home. Although much smaller, the Purple Hairstreak butterfly shares a surprising number of characteristics in common with its larger Imperial cousin. 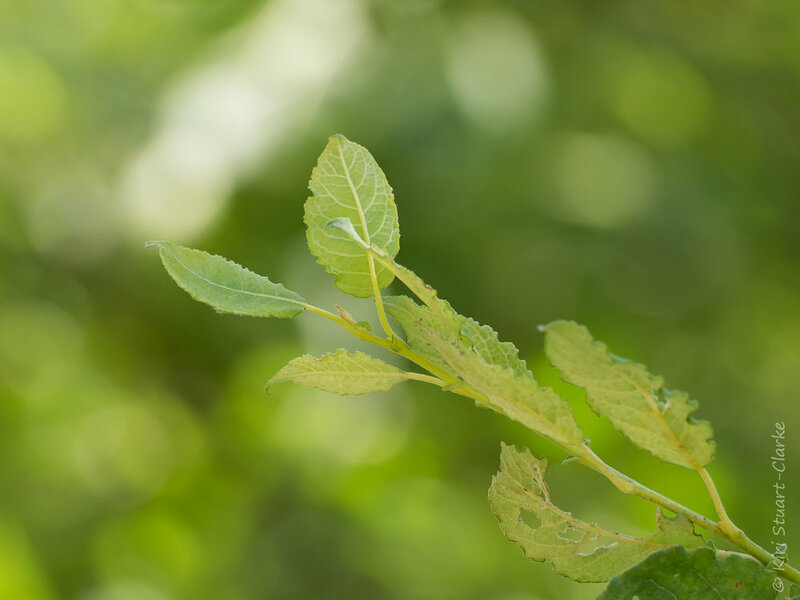 As suggested by its Latin species name "quercus" it too favours mature deciduous oak woodland and so is also highly elusive (and under-reported) as a result to its habit of dwelling up high amongst the tree canopy. There it lives on honeydew produced by aphids and only rarely descends from the "throne" for the odd sip of bramble nectar. While laid up I did my research thoroughly. Purple Hairstreaks being far more widespread than his majesty, I was able to find some promising local locations in Norfolk, and had in fact already experienced my first brief glimpse of a old faded and tattered Purple Hairstreak on a dog walk at Holkham Hall one August a few years back. I took a punt on a very short run up to the nearby Syderstone Common nature reserve, on the edge of North Norfolk coastal AONB. Its a large reserve of lowland gorse heathland, an SSSI that is famous for its Natterjack toad population, but not all that much else, in fact a previous visit had left me visually underwhelmed. This time however the reserve was transmuted into a spectacular sea of vivid fuchsia pink willowherb flowers swaying in the gentle breeze. My fieldcraft skills must have improved somewhat as I was delighted to spot an active Purple Hairstreak quite soon into my visit. There it was, a small grey blob fluttering away right up high in the treetops, initially silhouetted against the cloudy sky. Its flight was erratic and it was hard to keep track as the butterfly flitted amongst the oak treetop and nearby birches in the mature woodland circling this now spectactularly beautiful reserve. After spotting my Hairstreak's "Master" Oak I stayed for some time, craning my neck to try to spot this diminutive butterfly amongst the oak leaves. Eventually one dropped a little lower and permitted a quick shot before circling up high again in a cluster of nearby Birches. On my way back to the car I spotted a beautiful young buck Roe Deer, who paused, checked me out for a little while then barked at me before trotting off back into the Oak woodland, a beautiful end to my successful visit. Although my sightings had been distant and tantalising, I had bagged my first purple. Perhaps the abiding memory for me is not so much finally photographing my first purple butterfly, but rather Syderstone Common nature reserve itself, which was a natural habitat at the peak of its mid-summer glory and afforded a sensory firework display of wildflower delight at every turn. Visually the abundant vibrant pink Rosebay Willowherb flower spires intermingled with creeping carpets of rich yellow Tormentil, while the heady scent of rambling native Honeysuckle hung in the air and bramble in full bloom. Every plant seemed to be alive, swaying in the breeze and dancing with a host of orange Skipper, Ringlet and Meadow Brown butterflies flitting about into the distance as far as the eye could see. As for purple Royalty... I must now be patient, wait and bide my time till 2018 brings a whole new season and fresh opportunity for his Imperial Highness to ensnare me as subject. In an unprecedented week that saw the president of the largest Western Great Power turn his back on the Paris Accord to reduce emissions causing global climate change, I took advantage of ironically hot, sunny weather to visit Strumpshaw Fen RSPB Nature Reserve to see one of the UK's rarest and most threatened butterflies, the British Swallowtail, Papilio machaon britannicus. British Swallowtail, found only in Norfolk, busy nectaring on native yellow flag iris flowers. Taken from at least 1.4m away on a 300mm 4/3 crop OMD. The trip was an impromptu reprise of my longstanding attempts to enjoy watching this beautiful endangered Norfolk butterfly, which inspired a earlier blog post on my misadventures over several unsuccessful seasons attempting to find them at various Norfolk nature reserves. Last year, I was even interviewed as part of a BBC OneShow item on the native Swallowtail covering the story of a much more famous lepidopterist's longstanding desire to see them. This time I was hoping for more than a record shot of this rare and uniquely beautiful butterfly, one of only 6 butterfly species fully protected by UK Law since 1992. With the weather so fair sightings had been good all week so I was daring to hope for some natural behavioural shots of it amongst native fenland flora and habitat, rather than perched upon the pretty Sweet William in the renowned Doctor's flower garden. After a pleasant chat with a Welsh couple now close to completing a multi year hunt to see all of Britain's 59 native species, I had not ventured far into the reserve before I enjoyed a wonderful encounter of a freshly emerged Swallowtail first basking low down then fluttering up with its ghostlike flight pattern onto a nearby patch of deep yellow flag iris flowers where it began to nectar frenetically. Then the inevitable happened. It was after all Strumpshaw Fen, a sunny Sunday and Swallowtail peak season: The Lepidopteran papparazzi descended. Within minutes a host of papparazzi lenses, many far too short for the purpose, had surrounded the poor butterfly and their owners, caught up in the viewfinder, became oblivious to both other nature observers as well as the butterfly's wellbeing, and lens hoods started to encroach within inches of where the butterfly was attempting to feed up, blocking out both light and other people. I gently chaperoned and chastised as best I could to create space for the butterfly to feed and all to take turns to see, before moving on frustrated as the crowd grew too big and closed in again around the butterfly. I reflected on how , perfectly polite people, behind the viewfinder in focussed pursuit of the perfect digital trophy shot, rapidly became so blinkered and oblivious as to unwittingly block our others and even potentially disturb the rare and protected creature they had come to see. I speculated how many had walked right past numerous other fascinating wildlife and flower species without really stopping to enjoy and appreciate them, in their single-minded mission to capture the one famous "celebrity" species. It prompted me to question the drivers behind my own past mission too, though my long lens's minimum focus always helps ensure a respectful distance. On a bigger scale, it made me contemplate whether charities' tendency to focus on preserving single "blue chip" star species (using gallons of pesticides in the process) rather than untouched habitats is more a help or a hindrance in our efforts to help environmental recovery. Thinking back to the Paris Accord. I wonder whether it will ultimately ever really be possible for us, collectively as the human species, to overcome our ingrained survival instinct of self interest to do "the right thing" on a big enough scale in time. I hope so. If not, then perhaps our nation's own beautiful custard-yellow Swallowtail sub-species truly is already the ghost it sometimes appears to be, fluttering amongst it's beloved milkweed and flag iris. Taking off from a yellow flag iris flower, the British Swallowtail butterfly has been fully protected in UK law since 1992. Sometimes as a naturalist and photographer, certain subjects remain so stubbornly elusive that they become a bit of a nemesis. 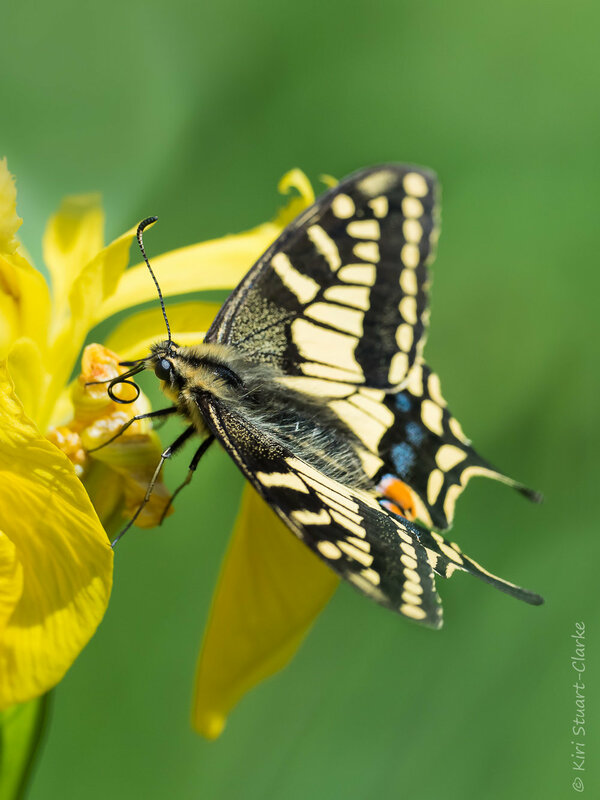 Britain's largest and most iconic species "papilio machaon britannicus", our very own British swallowtail, was one such unlucky species for me. So much so, that it took me some five years to achieve my first photograph of this amazingly beautiful butterfly. Our British swallowtail butterfly is actually a subspecies of the European strain that has adapted itself to use the delicate and somewhat sensitive fenland plant milk parsley as its caterpillar host plant. Once comparatively widespread in the south east, its range is now restricted to the Norfolk fens. Many of you will know that butterflies are one of my favourite wildlife species and I'm a passionate supporter of the Butterfly Conservation Society, which does a great job of raising awareness about the threats to this beautiful animal. Though scarce, I live in Norfolk, the same county that this elusive butterfly calls home. So just how hard can it really be to see one? Well timing is everything they say. The swallowtail is single brooded and has a relatively short flight period, from around mid May to mid June. If you add to that the need for reasonably clement weather, the window of opportunity is fairly narrow. In my defence, years one and two of my five year wash out were before I had relocated to live in Norfolk. Year three and I relocated to Norfolk, surely now I would just stumble across one right? Cue multiple trips to Hickling, How Hill and Strumpshaw, all known Swallowtail hotspots over the course of the next three years. Yet these attempts attempts to witness the beauty of this butterfly were always ill-fated. I forget how many times I met people and heard them say frustratingly, "oh there was one just down that path there " . Of course said Swallowtail invariably had vanished by the time I reached the spot, for all my luck, the Swallowtail might have been a capricious sprite from the cast of Shakespeare's a midsummer's nights dream. Last year life simply overtook me. My hunt started far too late in the season for success. So this year, I was determined, was to be the year of the Swallowtail. Come what may I was determined, I would find this iconic, awe-inspiring butterfly, no matter what! Spring this year was again cool and I was nervous, conditions were far from auspicious for a prompt emergence or a bountiful butterfly season in Norfolk. A visit to RSPB Strumpshaw Fen offered me my first fleeting, tantalising glimpse, but my bad luck struck again! Just as I arrived I glimpsed a large custard yellow butterfly swoop in...and it was, yes! ,,,.a swallowtail swooping in and aiming to land to nectar on white violet flowers at the main entrance. But even as I approached it was immediately spooked by an over-enthusiastic visitor waving his camera at it! This tourist seemed to be the incarnation of my Swallowtail nemesis, the butterfly equivalent of the "Man from Porlock" and opportunity lost. Assured by staff that they often returned, I stood stationary, sentinel-like for over an hour. Eventually a friendly gentlemen suggested another spot where he'd seen them "only a few hours before" - so off I trooped, yet to no avail. Another Swallowtail near miss, thwarted by mischance or fate, who knew and I finally started to see the funny side of it all. Perhaps my resignation and acceptance swung it and the gods took pity on me. I had only one last day left of even remotely suitable weather between what were quite vicious storm showers and off I went one last time on my Swallowtail mission. Back at Strumpshaw, now a familiar friend of a reserve, I ambled around the areas I'd been shown over the years, my jacket still done up against a nippy morning chill. Mercifully, the weather stubbornly refused to close in as forecast. I dawdled up and down the footpaths for about an hour, amidst cloudy intervals and cool, breezy conditions. Eventually, quite suddenly the sun won its battle against the grey and the temperature rose sharply. Suddenly, to my immense surprise and joy, an immaculate, freshly emerged swallowtail materialised from the tree canopy above, landing to nectar on some wild red campion blossoms, bouncing from flower to flower. I was taken aback by the sheer size and presence of this impressive, majestic almost magical, butterfly with its vibrant colours and bird-sized wingspan. At last, this bird-sized stunningly beautiful butterfly posed for me, even basking, its impressive wingspread outstretched whenever the sun vanished behind the lingering cloud to warm itself up in the spring breeze. My five year long mission was accomplished.